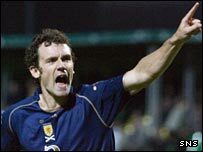 Scotland stretched their unbeaten away run to seven games to make it two wins out of two in their Euro 2008 campaign after a fine display in Lithuania. Tomas Zvirgzduaskas had an early effort headed off the line by Gary Naysmith. But Scotland took the lead after the break when Christian Dailly headed home a Naysmith corner. And Kenny Miller hammered in a second after hesitation in the home defence before a suberb Darius Miceika overhead kick produced a tense finish. Kris Boyd, scorer of two goals against the Faroe Islands on Saturday, had been dropped to the bench as Scotland adopted a more defensive formation for the Group B game in Kaunas. Gary Caldwell came into defence alongside Steve Pressley and David Weir as the captain earned his 50th cap. Lithuania midfielder Deividas Cesnauskis failed to recover from injury and joined Hearts colleague Edgaras Jankauskas on the sidelines. But club-mate Saulius Mikoliunas was in the starting line-up along with former Dunfermline defender Andrius Skerla as Algimantas Liubinskas' side looked to build on their fine 1-1 draw in Italy. They quickly forced a corner and a Zvirgzduaskas volley was heading for goal before Naysmith's intervention. Nigel Quashie forced Lithuania goalkeeper Zydrunas Karcemarskas into a diving save after meeting a Miller through ball 16 yards out. A Miller head-flick resulted in a goal-line block by Karcemarskas and James McFadden forced another save with a long-range effort. Mindaugas Kalonas sent a 20-yard drive a few feet wide for Lithuania before Scotland lost McFadden through injury. The introduction of defender Graham Alexander forced Scotland boss Walter Smith to reshuffle after just 22 minutes. Miller received a booking that means he will be banned from the next game against France as Scotland appeared to lose their goal threat. And Quashie hobbled off to be replaced with Boyd a couple of minutes before the break. But Scotland overcame those setbacks to break the deadlock in the opening seconds of the second half. Naysmith's corner was met by Dailly, who rose to head low past Karcemarskas from eight yards. Robertas Poskus ought to have equalised with a half-volley from 14 yards following a scramble in the Scotland penalty box. But Miller pounced on a long ball into the Lithuanian box before hammering home Scotland's second goal from 12 yards. Poskus again came close with a shot on the turn and Stankevicius forced goalkeeper Craig Gordon to turn his shot round the post at full stetch. Yet Scotland appeared to be in control until substitute Miceika gave Lithuania new hope with a superb effort from 15 yards. Lithuania: Karcemarskas, Stankevicius, Dziaukstas, Skerla, Zvirgzdauskas, Savenas (Tamosauskas 50), Kalonas, Mikoliunas (Labukas 66), Preiksaitis (Miceika 81), Poskus, Danilevicius. Subs Not Used: Malinauskas, Paulauskas, Zelmikas, Kavaliauskas. Booked: Zvirgzdauskas, Preiksaitis, Poskus, Kalonas. Scotland: Gordon, Dailly, Weir, Caldwell, Naysmith, Pressley, Fletcher, Quashie (Boyd 43), McFadden (Graham Alexander 21), Hartley (Severin 88), Miller. Subs Not Used: Neil Alexander, Anderson, Neilson, Teale. Goals: Dailly 46, Miller 62.